An odd-shaped formation of gas and dust at the centre of the Milky Way, captured by the far-infrared cameras on board ESA's Herschel space observatory. The nearly continuous strip of dense and cold clumps of material forms an infinity symbol, or sideways 8, that is a few hundred light years across. In this image, the strip twists around an invisible axis running roughly from the top left to the bottom right. The galactic centre is located almost 30,000 light years away from the Sun, in the direction of the Sagittarius constellation. It is a complex and dynamic place, with emission nebulae and supernova remnants – in addition to star-forming molecular clouds – surrounding the supermassive black hole that sits at our galaxy's core. The gas and dust in this region appears mostly dark when viewed through an optical telescope, but it can be seen clearly with Herschel's instruments. 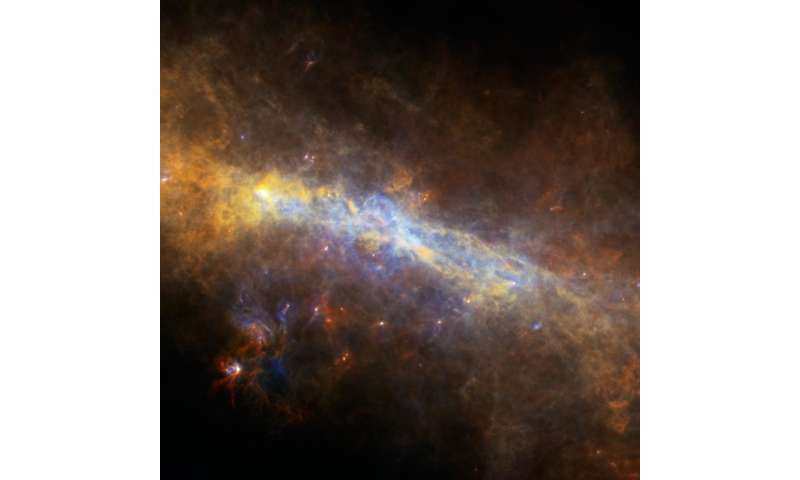 This image was captured by the Herschel's PACS (Photodetector Array Camera and Spectrometer) and SPIRE (Spectral and Photometric Imaging REceiver) far-infrared cameras, and it was first published in 2011. Obtained as part of Hi-GAL, the Herschel infrared Galactic Plane Survey, it combines observations at three different wavelengths: 70 microns (blue), 160 microns (green) and 250 microns (red). The nearly continuous strip of dense and cold clumps of material forms an infinity symbol, or sideways 8, that is a few hundred light years across. The obvious helical structure of an electric Birkeland current, it's what powers the galaxy. And the ring is the toroidal shape plasmoid at the center of the galaxy, no scary black hole monsters needed. Gosh cant, next you will reassure us not to be concerned that the propeller has flown off from the beanie worn by Giant Spacehopping Electrical Dust Bunny at the center of your EU cosmos. Oh yes they are. No plasmoid seen, and no way a plasmoid can explain the orbits of the stars around Sgr A*. Only braindead EUists could possibly believe such inane crap. Someone more patience than me? Please explain to the senile coot, the concepts of "perspective" and POV. The twisted pair of electric Birkeland currents with a donut shaped toroidal plasmid at the center is so clearly obvious it almost hurts.